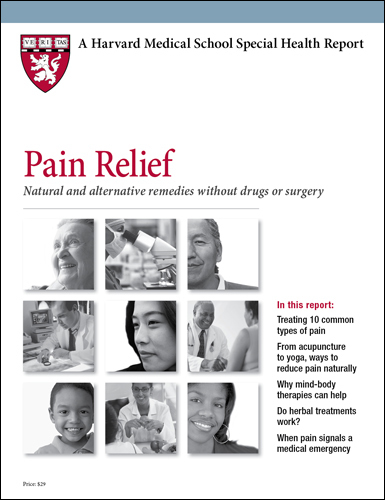 In Pain Relief, Harvard Medical School experts explain why more and more doctors are recommending mind-body therapies like tai chi, meditation, chiropractic, supplements, hypnosis therapy, and even yoga to help you get relief from dozens of painful conditions. STOP SUFFERING! Order Pain Relief Now! Mind-body techniques can help with pain management by helping you regain control over your pain response and by turning off the stress response that can worsen chronic pain. To elicit the relaxation response, a deep physiologic shift that is the opposite of the stress response, simply try these two steps. Step 1: Choose a calming focus. Good examples are your breath, a sound (“Om”), a short prayer, a positive word (such as “relax” or “peace”), or a phrase (“breathing in calm, breathing out tension”). Repeat this aloud or silently as you inhale or exhale. Step 2: Let go and relax. Don’t worry about how you’re doing. When you notice your mind wandering, simply take a deep breath or say to yourself “thinking, thinking,” and gently return to your focus. and get more pain-relieving secrets!